The central, original part of the Grand Cru Brand where Zind-Humbrecht owns land lies in an amphitheater that is oriented due south. The unusually easily weathered granite nourishes the vines and creates an even temperature throughout the day. 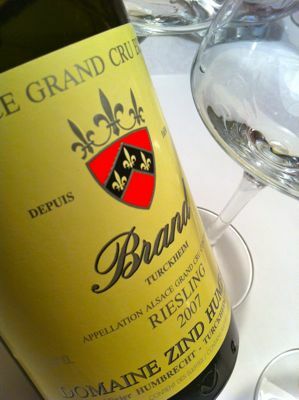 Therefore, the acids in a Brand are always soft and elegant, never aggressive, while the nose offers ripe fruits and flowers. A Brand can be drunk young but ages splendidly. 2007 Riesling Grand Cru Brand from Zind-Humbrecht in Turckheim is brilliant golden yellow. The scent is bright and extrovert and clean as a mountain lake with well-defined notes of honey, candied lemon, lilac, almond and a barely perceptible hint of petroleum. The taste has amazing volume of caressing and fresh fruit, as well as a wonderfully pure acidity which leads to a long finish with fine grip. A miracle of precision! 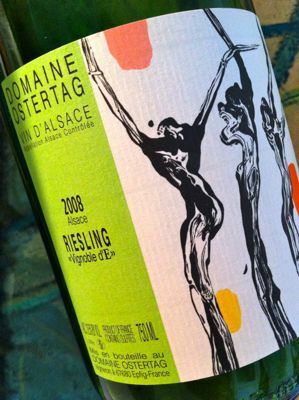 Alsace build his greatness on the pure, natural wines that highlight the grape variety and terroir. Wine complexity is normally based on low yields, a long growing season and careful vinification with élevage sur lie. But gradually, the use of oak increases. 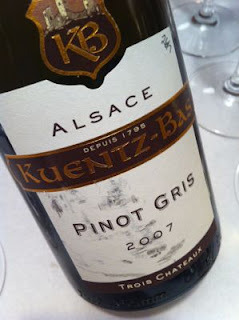 It is primarily Pinot Gris and Auxerrois which can carry the structure and the flavours that the oak carries with it. Andre Ostertag is famous for bringing up all kinds of wine in oak, but especially for the extremely high quality that characterises all his wines.